Technically this is a break between ROW80 rounds, so I don’t really have a check-in. Not that there’s much to say anyway… I’ve written, mostly, but I took a break from everything for the holiday and family gatherings. Still have a few more of those to get to yet, as well as writing up my Round 1 Goals for the Round of Words. For now… I have a WIPpet for you from Singer of the Swan Song. This will be the last of that story for a while. The brain has demanded a different focus… or perhaps a lack of focus. I’ve been drawn back toward the roots of my stories and how the universe developed in the first place. As before, this snippet follows directly after last week’s excerpt, Brave. Many, many thanks to Shan and Beth for their thoughtful crit-comments on that piece. I definitely got some ideas to work with there. For today’s WIPpet maths, I added the 1+2 from 12 to make three, then added a holiday extra. And it finished this section just right, I think. But what if… ‘Tara didn’t know if she could be more scared than she was already, but she had cried a lot the day ‘Listii’d gotten hurt. Was Mama sending her away now too? She cried again. It still hurt. Not just the tearing pain in her body, but her head burned so bad. Instead of being able to stifle her tears, Atara cried even louder. I hope you enjoyed this month’s offerings. Now why not head over to the WIPpet linky and visit some our other awesome members? 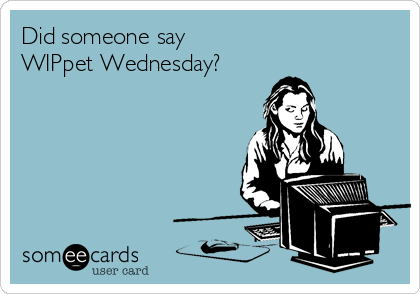 WIPpet Wednesdays are hosted by Emily Wrayburn at Letting the Voices Out.